With over a 150 islands between them, of which over 30 are inhabited the scope to explore and experience these unique and contrasting groups of islands is incredible. 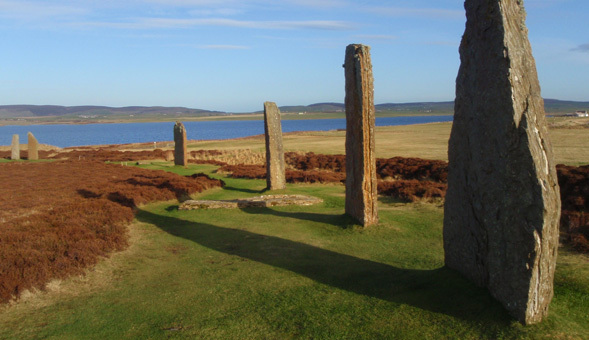 In mid-summer the day-light hours extend long beyond midnight adding to the allure of Orkney and Shetland. Both islands were once part of the Viking kingdom and offer a fascinating weave of dramatic seascapes, unique geology dating back to when they were a mountainous region of the Scottish and Scandinavian pre-Ice Age continent. On Orkney we take a cliff-top walk on Hoy, the wildest and highest of the islands, overlooking the famous sea-stack of the Old Man of Hoy. No holiday is complete without visiting the Neolithic village of Skara Brae and the Ring of Brodgar which forms part of the Heart of Neolithic Orkney World Heritage Site. On Shetland Mainland we climb Ronas Hill, at 450m the highest point on the Shetland Isles. This walk incorporates unique geology and rare alpine plants with stunning views over the western seaboard. We will visit Sumbourgh Head and the Stevenson Lighthouse which is one of the finest examples of 19th century architecture. 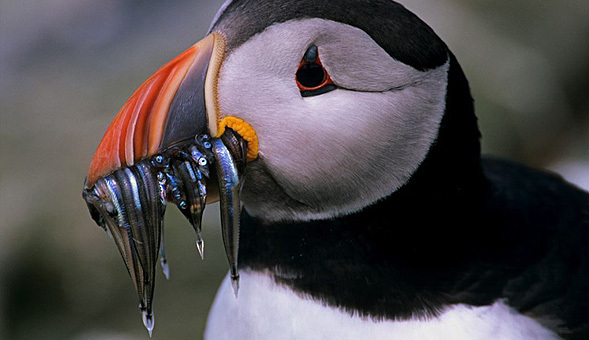 Both islands host an incredible array of birdlife, which includes puffins, short-eared owls and hen harriers. The abundance of seascapes affords us the chance to see seals, porpoises, dolphins and even whales. 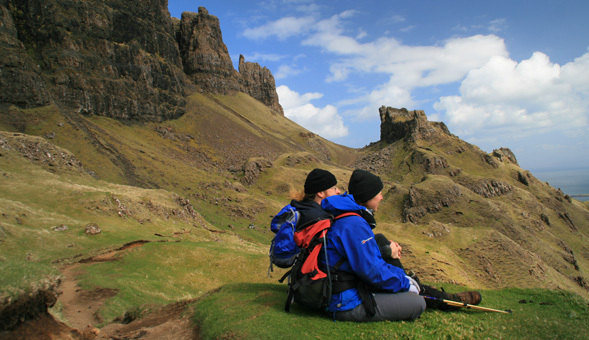 Most of the walking is along grassy swards high above the sea with occasional descents to wide, sweeping beaches. Your North-west Frontiers guide will meet you at Inverness Rail Station at 14.30. We will then drive to Scrabster by minibus, taking the ferry to Stromness and then transferring to our hotel in Kirkwall. 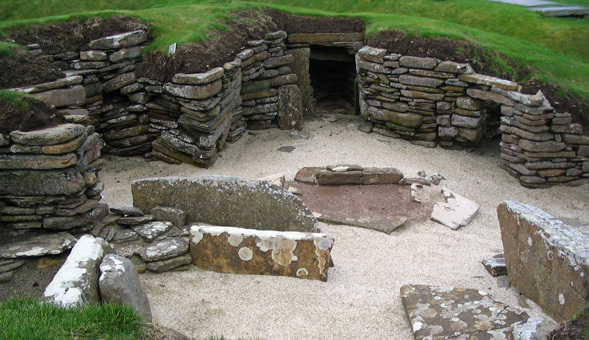 Visit to 5000-year-old Skara Brae, one of the best-preserved Neolithic villages in Europe. Long but easy walk southwards along the coast past Yesnaby fort and North Gaulton castle to Stromness. At the end of our walk we will have some time to spend in the pretty town of Stromness before returning to Kirkwall. Today we take the ferry to the virtually uninhabited island of Hoy. Hoy is the most dramatic of Orkneys islands with mountainous land rising over 1570 feet. We take a cliff top path with dramatic views of the 450 feet sea-stack of the Old Man of Hoy. 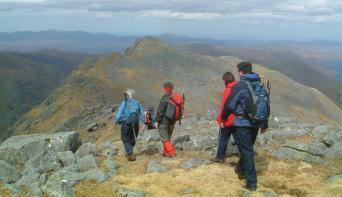 From here we have several very good walking options northwards or southwards, depending on group fitness and interest. We explore the peninsula of Deerness, the easternmost part of the Mainland. We walk to the Convenanters' Memorial and we will stroll along the coast round Mull Head. We continue to the Brough of Deerness and The Gloup, an impressive collapsed sea cave, making strange gurgling noises! Back in Kirkwall we have time to visit the Cathedral & Tankerness House, home of the Orkney Museum. Today we will visit the Island of Rousay and visit “The Egypt of the North” on the Westness walk. In the afternoon we will visit the beautiful gardens of Trumland House. After dinner we will catch the overnight ferry to Lerwick, Shetland. We start at Lunna, Lunna House was the heart of the Shetland Bus operation in the 2nd World War, which was the collaboration between the Royal Navey, the Shetland fishing fleet and the Norwegian resistance. 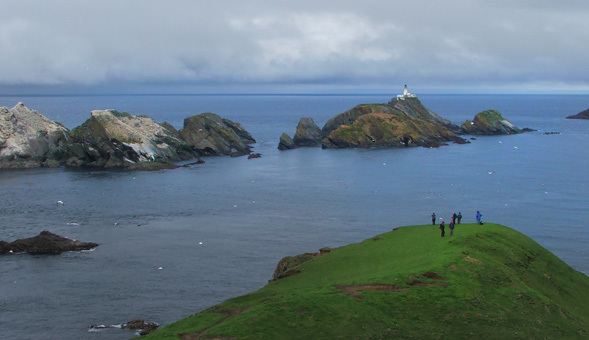 We walk the green rolling headland overlooking the North Sea then visit Scalloway, the ancient capital of Shetland. Ronas Hill is the highest point of the Shetland Isles (1475 ft). The walk will incorporate unique geology, rare alpine plants and stunning views over the Western seaboard. There is also a Neolithic chambered cairn on the summit. Today we visit Sumborough head in South Shetland to view the puffin colony nesting around the Stevenson lighthouse. Later we will visit the island of Mousa and the famous Iron Age Broch tower. These are unique to northern Scotland and this one is the only one still standing fully intact. Fethaland,is the most northerly point of Shetland Mainland and an area of outstanding beauty. The site of one of the 19th century haaf fishing stations where we can see the stone fishing huts and boat nousts. Our day sees us walk on the island of Whalsay which has its roots in the fishing industry although its history stretches back over 4,000 years. Along with wonderful flora and birdlife this is a great way to round off our holiday. Late afternoon we will catch the overnight ferry back to Aberdeen. After arriving in Aberdeen in the morning we will make the 2.30 hour journey back to Inverness. During the first 4 nights we stay at the comfortable Orkney Hotel. You can be sure of traditional Orcadian hospitality in the heart of the ancient royal burgh of Kirkwall. Dating back to 1670, the hotel has been sympathetically renovated, retaining many of its original features and its charm. On Shetland we stay 4 nights in a quality, hand-picked guesthouse in Lerwick on Shetland Mainland. During the holiday there are two overnight ferry journeys (between Orkney & Shetland and between Shetland back to the mainland). We will book standard cabin accommodation. A limited number of single rooms are available from £200 for 8 nights. Please contact us for the price of a single cabin on the overnight ferries (2 nights). If you prefer to fly to Kirkwall, you will meet your guide and fellow group members in the hotel lounge at around 21:30. In case you fly you will have to make your own way from the airport to your hotel (a taxi costs around £10). Instead of taking the overnight ferry it is possible to fly back from Lerwick. In that case you will have to make your own way to the airport in Sumburgh. There is a good bus service between Lerwick and the airport. Please contact us if you prefer to fly, so we can deduct the ferry cost from your holiday price. "Very interesting itinerary. Standard of walks very high and appropriate for the group. Our guide Angela was informative and very interested in the clients. Sites well chosen"
"We are very happy to have taken this trip. Angela was a great guide. We had great weather and the other groupmembers were congenial"